4D Systems, available through GLYN High-Tech Distribution , have introduced the GOLDELOX-GFX graphics processor, a new concept in LCD and OLED display technology. It is completely configurable and can interface with many LCD and OLED displays and implements a set of integrated high-level graphics and I/O functions controlled by E.V.E. (Extensible Virtual Engine). EVE is a proprietary, high performance virtual processor implemented across a variety of architectures to provide a single unified platform. This enables the same application code developed for the GOLDELOX-GFX to run on other 4D custom processors (with EVE implementation) such as the PICASO-GFX. Users do not have to worry about selecting third party C source libraries, or which microcontroller to use. Users only need to choose their display, interface it to the GOLDELOX-GFX on a PCB and add some I/O, depending on their application. Finally, users must select the PmmC file that matches their display driver IC (such as the GOLDELOX-GFX-1339.pmmc for the SSD1339 display IC from Solomon) and download this into the GOLDELOX-GFX chip through the serial port, resulting in a powerful single chip graphics user interface solution. With this process, users can write their code in 4DGL (a high level 4D graphics language) using the 4D workshop (editor and compiler) and save development time on their next embedded graphics project. The 4DGL is a graphics oriented language allowing the developer to write applications in a high level language and syntax similar to popular languages such as BASIC, C and Pascal. 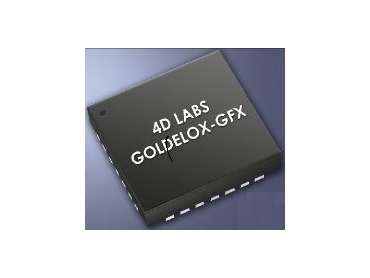 The I/O features of the GOLDELOX-GFX can interface to serial, analogue, digital, sound generation and Dallas 1-wire devices. In complex applications, the users can offload most of their graphics overhead to the GOLDELOX-GFX and send serial commands to perform the required actions from their favourite host processor. All the LCD and OLED built-in driver libraries implement and share the same high-level function interface, allowing the user’s GUI application to be portable to different display controller types. The GOLDELOX-GFX is available in a 28 pin QFN package.